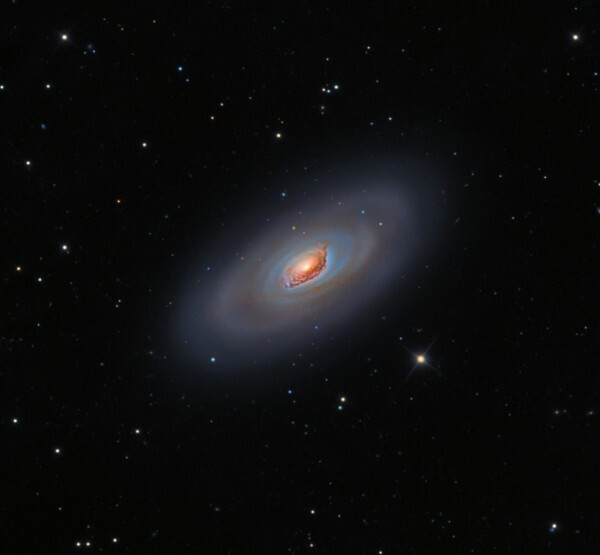 This is Meissner 64 (or M64), a textbook example of spiral galaxy. Also it is known as the “black eye” for its curious shape where the center, a super dense gas area, gives the name. They located 17 million light years from Earth, in the center are forming new stars at existing concentration of hydrogen clouds. In addition, we note that by gravity, are at high temperatures, which is granted by the reddish color so beautiful. What sets this galaxy apart is not whether the (also) but the disk of stars rotating in the opposite direction to the center gas) something very curious. And say, because if the angular momentum states that everything must rotate in the same direction, as happens in our solar system ?. Simple, because it is not a galaxy but are two that have collided and clouds are remnants of what is left of the crash, so they have a different angular momentum and is quite normal. Gas is the compression of both galaxies, but “killed” many stars are born to make new ones. The process of life in our universe before our eyes.